Alamar served as advisor to state delegations from California, New York, Delaware, Illinois, Georgia, Mississippi, South Dakota. Alamar client signs multiple contracts for sale of frozen poultry to Cuba. Alamar client signs multiple contracts for sale of wood products to Cuba. Alamar client signs contract for first sale of organic fertilizer to Cuba. 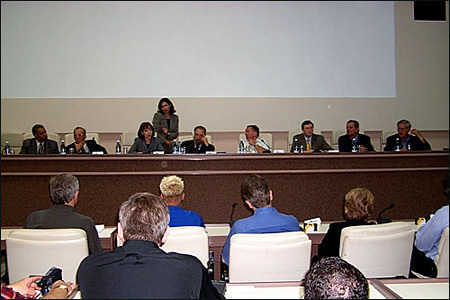 Three Alamar clients participate in May, 2007 meeting in Havana. Alamar Florida client signs contract for sale of fresh produce to Cuba. Alamar assists major U.S. producer of chewing gum to negotiate first such contract with Alimport for sales to Cuba. Alamar co-sponsors U.S.-Cuba Travel Conference in Cancun, October, 2003. Alamar co-sponsor of U.S.-Cuba Agricultural Conference, Cancun, February, 2003. Four Alamar clients participate in September, 2002, Agricultural Trade Show in Havana. Assists major U.S. gulf port to travel to Cuba, meet with Alimport officials, have lunch with President Castro, visit Havana port facilities and reach agreement for shipments of agricultural products through port. With 48 hours notice, arranged visit to Cuba for U.S. poultry company, obtained visas, set up meeting in Havana with Alimport, and participated in negotiations which resulted in contract for sale of 1000 tons (double the original amount) of frozen poultry for delivery in early 2002. Co-organizer of major business conference entitled "U.S. Agricultural Sales to Cuba," Cancun, Mexico, January 29-February 3,2002. Arranged visit to Cuba for selected participants in Cancun conference, "U.S. Agricultural Sales to Cuba," February, 2002. 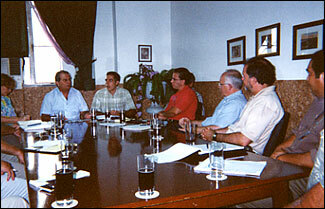 Advisor to YPO Family University visit to Cuba by 100 CEOs , Jan., 2002. Facilitated visit to Cuba for State of Illinois official delegation of medical companies, January, 2002. Consultant to World Presidents Organization (WPO) for trip to Cuba for 25 CEOs, January 2002. Coordinated participation of U.S. executives in international conference organized by Canadian WPO, February, 2003. Created in 1974, Alamar Associates has consulted with hundreds of U.S. corporations, organizations, and media outlets interested in pursuing business in and with Cuba. Based in Washington, D.C., Alamar is headed by Kirby Jones. Alamar assists clients to negotiate contracts to sell agricultural and food products to Cuba, obtain travel licenses from the U.S. Government, and arrange visits to Cuba with an agenda tailored to the interest of each client. Through its personal relationships with Cuban officials, Alamar personnel can provide counsel, insight, and a road map into the workings of the government of Cuba based on three decades of first-hand knowledge and personal contacts. Alamar takes the guesswork out of dealing with a government that has largely been shut off by the United States for more than 40 years. We understand it is difficult to know whom to call or what information is required in order to even begin the process of assessing the market potential. Alamar has saved companies time and expense by helping them develop and undertake a targeted approach to doing business in Cuba. Alamar clients have been among the first to sell products to Cuba since late 2001. 1. Market Entry: There are few countries in which business conditions are changing as rapidly as they are in Cuba. There are no countries about which it is more difficult to understand the rules and the most efficient and cost effective way to carry out or get ready for potential business. Alamar helps clients to position themselves for this opportunity. Utilizing its knowledge and relationships developed over 30 years, Alamar has been able to help clients do business, get ahead of its competitors, meet with Cuban business counterparts, and establish contacts with companies already doing business in Cuba. 2. Person to Person Contact with Cuban Officials: As with any other country, nothing can substitute for visiting Cuba and meeting with the officials who deal in your product or service. There are several ways in which U.S. firms can make visits to Cuba within the current U.S. laws and regulations. Alamar can arrange these visits, set up your appointments, handle all visa and immigration requirements, and travel with you to assure that all goes smoothly. President of Alimport (at end of table). 3. Licenses: Several Alamar corporate clients have been able to obtain U.S. Treasury licenses to travel to Cuba and Commerce Department licenses to sell to Cuba. 4. Humanitarian Donations: Several U.S. firms have donated various products to Cuba under license by U.S. Treasury. Through its partnership with us-based non-profit and humanitarian organizations already licensed and experienced in this effort, Alamar can help clients participate in this activity while introducing their products to Cuba. "When the Georgia Department of Agriculture wanted to bring Georgia companies to Cuba, we asked Kirby Jones and Alamar to set up the visit. He arranged for us to meet the people we needed to see and to visit the places of interest to the participants. As a result of this trip, several Georgia firms now have their own on-going relationships with Cuban officials." 5. Market Studies: Alamar personnel can prepare profiles and analyses of the sectors of interest to your company which provide information upon which a business plan can be developed. Through its contacts with government officials and local firms in Havana, Alamar Associates is able to access information that is not readily available in U.S. publications. Such information can be assembled to provide an objective look at any particular business or commercial activity. President Fidel Castro meets with participants of U.S.-Cuba Business Conference at Palacio de Convenciones in Havana, Feb. 19, 2003 -(from left) Raul de la Nuez, Minister of Trade; Ricardo Alarcon, President of National Assembly; U.S. Senator Maria Cantwell; Juanita Vera (translator standing); President Fidel Castro; Kirby Jones, President of Alamar Associates; U.S. Senator Kent Conrad; Pedro Alvarez, Chairman of Alimport; John Moore, Lt. Gov. of Kansas. 6. Seminars and Conferences: Alamar arranges for clients to attend various meetings inside and outside the U.S. These include the U.S.-Cuba Business Summits as well as special seminars to hear about the status of current U.S. legislation, changes in the laws, or recent economic development in Cuba. Mr. Kirby Jones is very well known and highly respected by Cuban officials in the Industry and Goverment at all levels. He personally understands extremely well the Cuban system and how to get things done in this emerging market."